In order to understand the Kachina spirit properties, it is necessary to first understand that the Hopi were a very spiritual, creative, and, above all, peaceful people. They were excellent craftsmen, agriculturalists and artisans, with the capability to coax corn into growing in their desert homeland. The Hopi symbolism were highly regarded. They took them quite seriously, imprinting them on many forms of artwork. Kachina symbols were no different, and were frequently seen on baskets and pottery, drawn as tattoos, made into dolls, and worn as masks during important rituals and ceremonies. 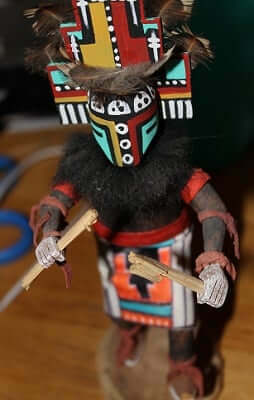 Hopi tradition uses the term “Kachina” to describe supernatural beings that are connected with the forces of nature. They are not considered gods, but rather allies that people can turn to for counsel and education. Kachina symbolism and the various ways that they can be represented produce a lengthy list of properties that are associated with the spirits. Each of these properties can be invoked more easily when the seeker (Hopi or not) has a purpose, particularly if this purpose pertains to crop fertility and/or abundance in their life. The first Kachina property that we will consider is the sun symbol, which the Hopi call “Tawa Kachina”. This symbol, with its face and projecting rays, personifies the sun and makes it easy to don during festive activity. The Hopi traditionally create an image of Tawa Kachina to wear during the solstice ceremony. By wearing a likeness of the sun during this critical time of the year, the Hopi people felt that they could lure the sun’s return after winter and begin the growing season. This is fitting, as the Tawa Kachina is thought to be not only a symbol of the sun, but also of life, growth, and abundance. Additionally, it is a signal of the strength of spirit found within each of us. Alternatively, the Hemis Kachina, pictured as a temple-like house, is a symbol of rain. Like the sun (and thus the Tawa Kachina), rain is necessary for the growth and health of crops. This kachina also brings an abundance that is necessary for a high crop yield, in a separate but equal fashion. During festivals, the Hopi may shake rattles bearing this symbol in order to beckon the rain. Hemis Kachina is also thought to bring fertility to the Hopi people. Like all other cultures, the Hopi also had theories and opinions on death and the underworld. They called the ruler of the underworld the “Masau Kachina”. However, this Kachina symbolic meaning also reigned over the Earth, as well. As protector and controller of the world, this spirit governed the arrival of all other Kachinas, which made their presence known during the summer and winter solstices. In the eyes of the Hopi, this spirit demanded respect and homage, and to neglect to do so would be an extreme folly. Masau Kachina, which is pictured with tree branches, was both respected and feared among this group of people. On a lighter note, the Puchkofmoktala Kachina, portrayed as either a scorpion or a horned runner, was known as the comical spirit. This playful Kachina is typically felt running races, playing games, and spreading joy during ceremonial times. However, Puchkofmoktala is also known to be a bit devious and a trickster, throwing sticks at competitors that are beating it in a competition. The last of the major Hopi Kachinas is the Crow Mother, which is (quite obviously) shown as a depiction of a crow. 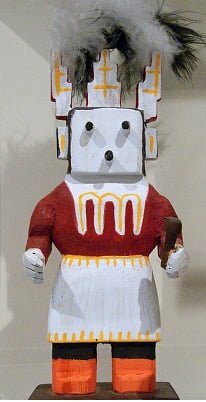 This kachina symbolic meaning is highly unique compared to the others. The above-mentioned kachinas walk the Earth and make themselves known to people during the solstices of winter and summer, making themselves readily available for believers on several occasions throughout the year. However, the Crow Mother appears during the winter only. According to Hopi legend, she comes with a basket full of sprouts in order to inspire seeds to germinate, even in the cold grips of winter. In order to fully comprehend the depths of Hopi culture and Kachina symbolism, one must pay attention to and study the creativity and spirituality put into their artistry, stories, and way of life. This is no quick and simple task, but it is well worth the intellectual journey.